If your module has regular Collaborate sessions, your lecturer will have a link to the Collaborate scheduler in your Blackboard course. 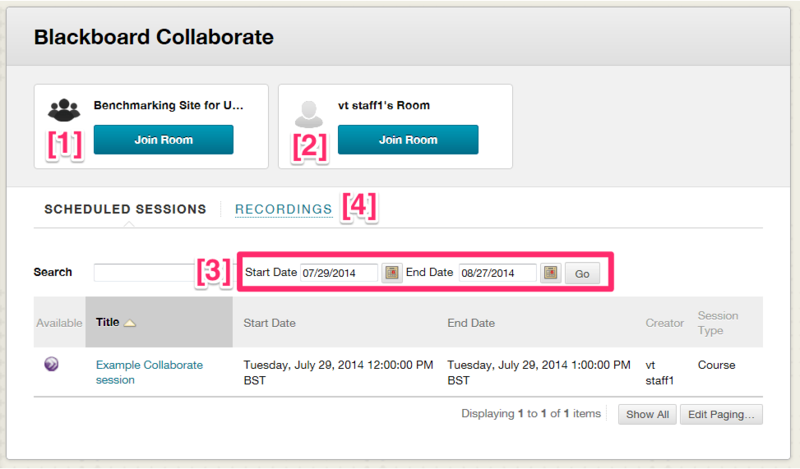 These steps show you how to use this tool to find your session, room, or recording. In other cases, your lecturer may provide links to directly to individual sessions in your module’s content areas. If enabled by your lecturer, you will see the Course Room  and your lecturer’s room(s)  listed at the top of the page. By default, all scheduled sessions due to start in the next 30 days will be displayed. You can change the Start Date and End Dates  to see information about sessions in a different date range. To launch a session, click its title. To see recordings click Recordings  and change the date arrange as applicable. By default recordings made in the last 30 days will be displayed. As with scheduled sessions, you can change the date range, and click the title to launch the session. If using a mobile device, access the session in the same way but make sure that you have the relevant app installed. Upon clicking the link in Blackboard from your device’s browser, the app will launch.